TransitScreen is making it easier for building employees and residents to consider their most readily available transportation options with real-time information. “Our solution provides information to foster sustainable, walkable, bikeable cities of the future while promoting behaviour change and reducing parking and traffic on city streets,” said TransitScreen head of Canada and Latin America Andres Trivino. Creating opportunities for employees to walk and take public transit to work is part of Avison Young’s company-wide sustainability and corporate social responsibility strategy, so McDonald sees TransitScreen as a tool to facilitate that. It was installed on a wall in a high-traffic area of the office and went live on March 9. TransitScreens are available for commercial and residential buildings and are customizable to specific locations. In Toronto, information can be displayed for the closest modes of transportation provided by the Toronto Transit Commission as well as GO Transit, York Region Transit, Zipcar, AutoShare, Car2Go and Bike Share Toronto. McDonald said his office’s screen also includes information about the Uber transportation network and will add the Union Pearson Express train when it’s up and running. Employee feedback has been “great” regarding the convenience it adds to getting to and from the office at the beginning and end of the day as well as for meetings and building site visits during the day. 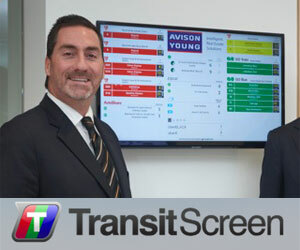 Avison Young’s New York office has met with TransitScreen to see if it makes sense to install one there, and its Canadian branches will have conversations with the company over the next few weeks. TransitScreen is a web application and can run on any computer, smart phone or tablet so details can be viewed remotely as well as on the primary wall-mounted screens. TransitScreen negotiates individual deals with each client so it won’t disclose costs, but they include an upfront charge and monthly maintenance fees. Advertising revenue-sharing models have been created between TransitScreen and selected real estate partners in the United States. “Our primary market is real estate,” said Trivino. “We also work with cities, large organizations, universities, infrastructure and media companies. TransitScreen has also introduced SmartWalk, a digital display of real time transit information that includes walking directions that can be projected on a sidewalk or wall. Information about local landmarks can also be shown, including direction, distance and whether they’re open or closed. Trivino said SmartWalk is particularly useful for entertainment and sports venues such as stadiums and arenas to direct people after events.